You feel obligated because it’s St. Patrick’s, but does it really belong on the plate? Although technically corned beef is an Irish thing, you’re not going to find it anywhere close to something that was eaten or served in any true Irish establishment. If they are going to eat beef, it’s going to be fresh. Corned beef was an export item. But, to get your head around that, you have to look at the background of the beef. In addition to the rolling hills chucked full of lamb and sheep, Ireland produces a lot of quality beef. (Currently, they control 16% of the export EU beef market.) The fertile grasslands and the constant temperatures allowing the cattle to graze on fresh grass throughout the year, produced some of the highest quality beef in the world. That, made it in demand, and demand meant money. So, beef was exported to other parts of Europe. England and France being the largest customers, consumed somewhere around 90% of the Irish beef market. So, reasonably speaking, that leaves around 10% for domestic use. It would be expensive and it wouldn’t be eaten by the bulk of the Irish population. 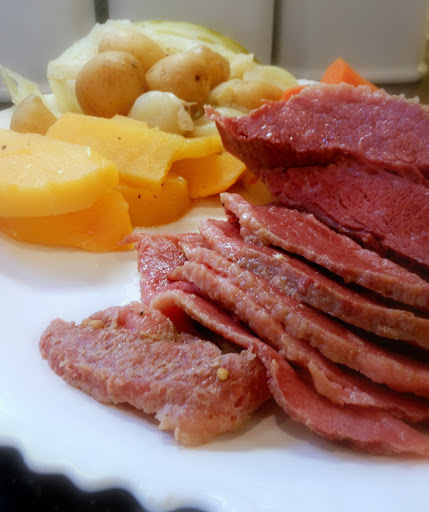 Where corned beef came into the picture was on the ships transporting Irish, well… mainly Irish immigrants to our side of the pond. Ships unfortunately are damp, damp places, and a fresh side beef is just going to be a huge gooey mess by the time it reached it’s destination. In order for beef to make the two week (plus) trip to the east coast, it had to be cured…. and salt was the cheapest curative available at that time. So, as our new nationals stepped off the ships, along with them came vast supplies of cured beef to help feed all the new citizens. Yes… Corned Beef. 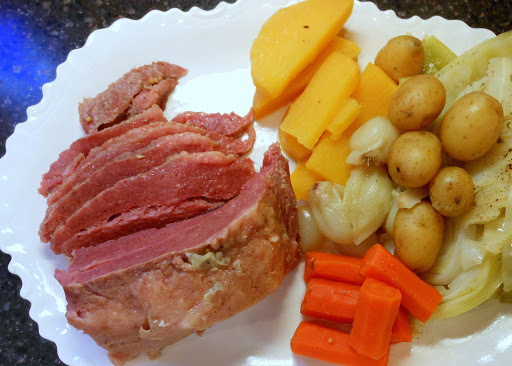 The corned beef and cabbage dish we’ve all come to love most likely originated as an adaptation of a local Irish recipe for Bacon and Cabbage, which was really a smoked loin of pork instead of actual bacon. The loin was boiled in water with carrots and cabbage; the boiling removed enough of the salt cure to make the cured beef edible. Since it was a cheap meal to prepare, the immigrants made it frequently – forever endearing Corned Beef and Cabbage as an imported Irish staple. 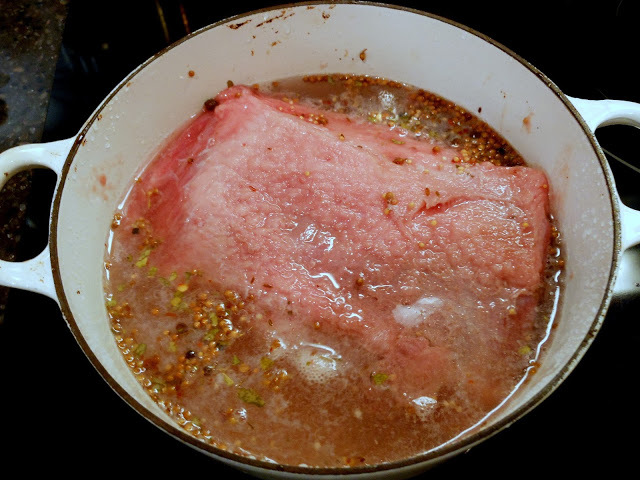 Slice the corned beef into 1/2 to 1″ thick slices – across the grain. When you get right down to it…. although it’s probably one of the most non-technical things I make, it is still just about my favorite meal. I could eat it every week and not get tired of those cured flavors and rooty veg in the broth. Thanks so much for stopping by! Congratulations! We wanted to inform you that this post has been selected as a Featured Archive Post on our site for the month of March 2014! 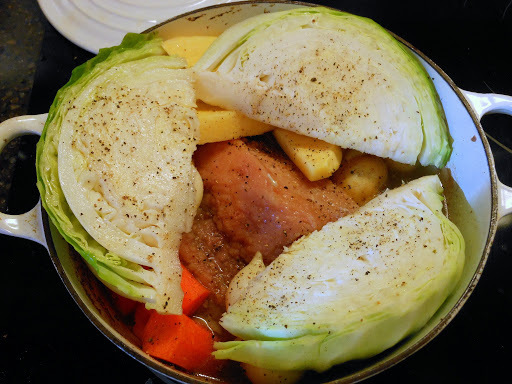 For many, many years I could not bring myself to eat corned beef … horrific childhood memories of dry, over-salty corned beef accompanied by cabbage and carrots with the absolute bejeezus boiled out of them, and for good measure boiled onions in gloopy white sauce. Very, very bad memories. By comparison your corned beef looks glorious, and I appreciate the reminder that it's something I haven't eaten for a few years – must rectify. Toby, is this corned beef the same as the ones that come in a can? I usually eat the canned ones and the texture is not like the one you are using here.